Gather in support of U.S.-Nicaragua Solidarity for an inspiring evening of TRADITIONAL FOOD, STORYTELLING, & LATIN DANCE! Support sustainability for a Nicaraguan community through your donation and attendance! 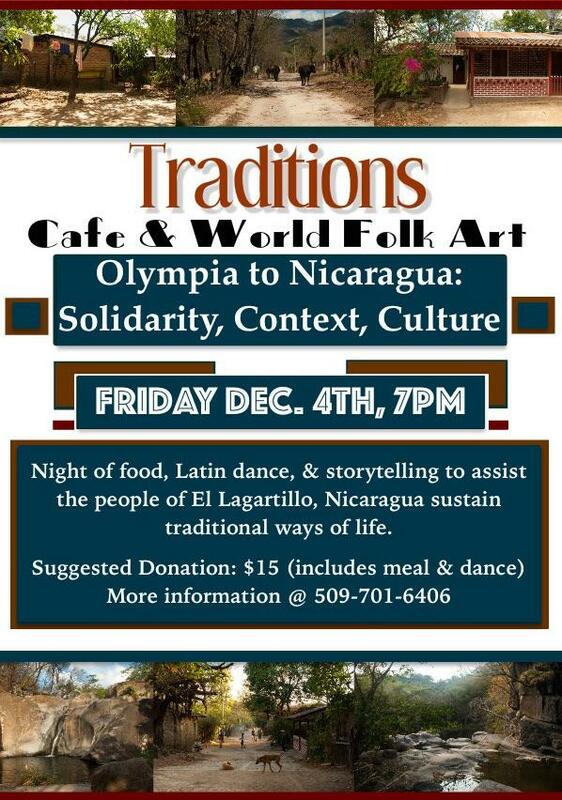 Suggested donation of grants admission, a meal, a bachata lesson by Stephanie Perceful and a rich cultural experience and opportunity to learn about the ongoing need for solidarity between Olympia and Nicaragua. Beer and wine will be available for purchase through Traditions. This is a family friendly event! The fundraiser will benefit the rural community of El Lagartillo. Nestled in the Northern Highlands of Nicaragua, the community is home to a resilient and progressive people. All money raised will directly support this exceptionally organized community in thier effort to cultivate and purchase the land which sustains them. A foreign investor has indicated interest in purchasing the acreage for private use, making this a critical and urgent cause for the future of Lagartillo. Please help support this incredible community through its resistance to destructive Neoliberal policy. For more information about El Lagartillo, please visit the following links.